How often do we walk from car to building without noticing the smells, sounds and sights around us? How many types of trees do you know and how many can you recognize by their leaves? Naturalist and author Clare Walker Leslie has made it her life's passion to encourage people to stop and take a look, to appreciate the natural world simply by carefully and mindfully observing it. Her nature books and journals, which feature beautiful hand-drawn illustrations of her own observations, are well-loved and have inspired a great many followers. 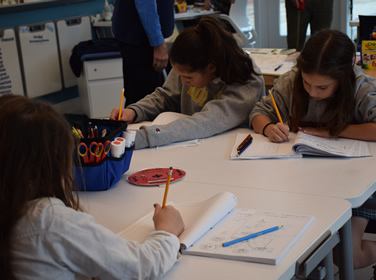 Bullis was fortunate to host her for a few days in December, where she shared her methods and tips with students, teachers, and parents. Ms. Leslie worked with each Lower School science class alongside teacher Mark Walter. 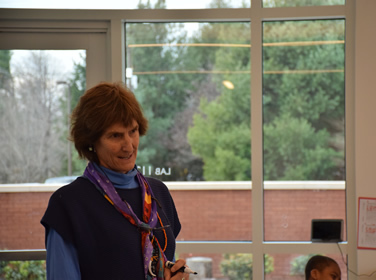 Mr. Walter had enjoyed her books during his graduate school years, and was pleased to be able to invite her to Bullis with the support of the school's Parent Association Faculty Enrichment Grants program. Ms. Leslie took each class outside for a portion of her time with the students. 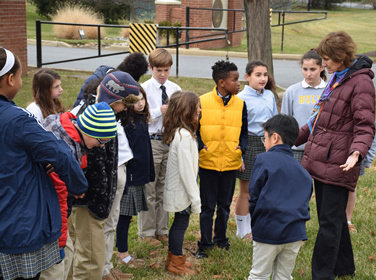 She encouraged the students to quietly take in their surroundings as they walked around the Bullis campus. They did not need to walk far from the classroom to be able to, perhaps for the first time, truly see the trees, grass, insects, and other items in nature that are otherwise easy to ignore. "What do you smell?" she asked, indicating that certain trees and bushes emit specific smells. "Come look at these ladybugs huddled under a window sill," she beckoned. "What can you see on the bark of this tree," as she pointed out scrapings that indicated recent deer visits. When the students returned to the classroom, they were asked to draw what they saw in their sketchbooks. "Kindergarteners were asked to show the colors of the day," explained Mr. Walter, "while the older students were invited to draw more specific observations." 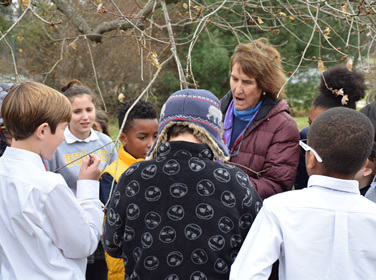 For Mr. Walter, Ms. Leslie's visit achieved his goal of encouraging students to connect with nature. "We easily get caught up in curricular goals and tasks, but we must remember our connections with nature. This has reminded me to regularly bring that into my teaching. I want to make science less abstract and connect it to my students' daily lives, so they can grow up to be good citizen scientists and make an impact in protecting our environment." Mr. Walter also appreciated Ms. Leslie modeling her approach of sitting and drawing rather than relying on cameras to capture nature. "Nothing replaces observation and taking the time to reflect and draw what you see, what is prominent to your experience." Ms. Leslie also taught an after school workshop for parents and teachers to join in and learn more about the power of observation and the natural world. "I was so impressed with the overall interest, curiosity, and positive behavior of the students," she said. "We had great fun outdoors, the weather worked well for us, and four blue birds even flew up onto a nearby wire to pose for us!" Ms. Leslie has taught in schools around the country for more than 40 years. "Sadly, many schools no longer have financing for nature outdoor studies, since they are so pressed with other academic and scheduling demands," she said. "Other than in organized sports, kids today don't spend much free time outdoors. Their knowledge of their own local nature is limited, and this will ultimately have a grave effect all the way up and down the socio/political ladder. How can you protect something you know nothing about? We cannot disregard the natural landscape that provides for us, and our planet is showing the consequences. I want kids to care about nature, simple as that, and by observing drawing, writing and learning, they can come to care." 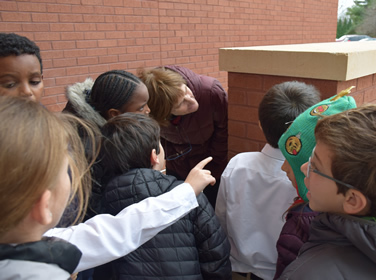 Mrs. Leslie's teaching is "nothing fancy," as Mr. Walter described the way she led the students to observe the sky, the clouds, and trees around them. Yet, the simple wonders of nature were his goal to share with his students. "Best science class ever!" declared one 4th grade boy.